Oh my gosh!! I’m so excited!! I finally have Frankincense Essential Oil!!! Oops! In my excitement I totally forgot my manners!! Greetings & welcome to LBEliteAromas blog. We discuss Aromatherapy, Essential Oils. Meditation & Yoga. Today we’ll talk about a very old & famous Essential Oil, Frankincense. today!!! I’ve been curious about Frankincense since I started this community & the time finally arrived!! Now, lets look at this ancient oil. Frankincense (Boswellia sacara) come from the old French “franc encens”, meaning “quality incense”. Frankincense was highly valued by kings & the wealthy during ancient times. You may have heard it was one of the gifts from the Magi or Wise Men to Baby Jesus. Gold (symbol of kinship on earth), Frankincense (symbol of deity) & Myrrh (symbol of death). There’s more to these gifts then the spiritual symbols & we’re only going to explore some of the other properties of Frankincense today. As I mentioned, Frankincense was a highly valued commodity for thousands of years. 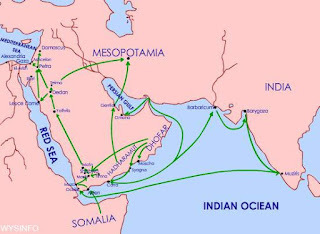 Ancient Egyptians would buy the resin by the boatloads from the Phoenicians. Since at least 500 BC Frankincense has been a staple in traditional Chinese medicine. One of the reasons is because of its health properties (although some of its other applications include insect repellent, perfume, incense & embalming). Frankincense Essential Oil can reduce pain & inflammation, it boosts the immune system & mood, combats infections, aids in digestion, is analgesic, anti-fungal, anti-oxidant, anti-septic, an expectorant, aids in the relief of coughs, sore throats, strep, pneumonia, staph infections, reduces stress, calms the nervous system, boosts the mood & more. At the time Jesus was born, infant mortality rate was very high. Frankincense would have been used by the wealthy to improve their child’s chances of survival. This would have been a very practical & appropriate gift to give a king. tree. This teardrop-shaped resin is the natural state of Frankincense. It’s how it would have been used in antiquity. It is edible & often chewed like gum. It is also burned in this form & crushed for use. There’s a whole other process to turn it into the liquid oil & some of its properties are lost in the process. That doesn’t mean that Frankincense Essential Oil is of any less use, because there are many uses & benefits we can obtain from it. Frankincense Essential Oil is known to strengthen your skin, improve the tone & elasticity & reduces the signs of aging. It can help fade scars, acne & stretch marks. It can lift the skin & heal dry or cracked skin. It’s an antiseptic & disinfectant. Diffused in your home can help eliminate the cold & flu germs from both home & body. It will aid in the prevention of germs forming on your skin, mouth or in your home. You can make your own disinfectant cleaner using a Frankincense blend instead of harmful chemicals. There have been studies that demonstrate the immune-enhancing abilities of Frankincense Essential Oil. It helps destroy dangerous bacteria, viruses & even some cancers. Using Frankincense in a homemade mouth rinse will help prevent bad breath, cavities, mouth sores, gingivitis, toothaches & other infections. 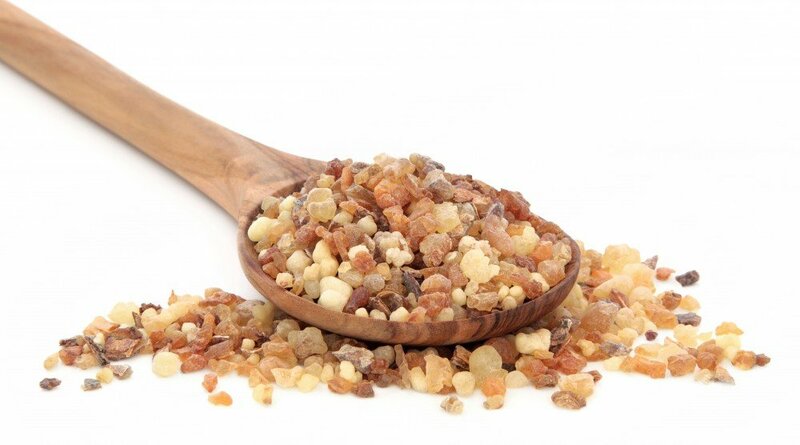 Frankincense is used to assist the digestive system in properly detoxing & its elimination from the body. It helps in reducing bloating & PMS related [stomach pains]. It relieves [stomach pain], cramping & nausea. It encourages proper digestive health by increasing the secretion of digestive enzymes, urination production, relaxing the digestive tract muscles & improving circulation. Frankincense Essential Oil has shown to be beneficial in relieving symptoms of chronic colitis, ulcerative colitis, leaky gut syndrome, IBS & Crohn’s disease. 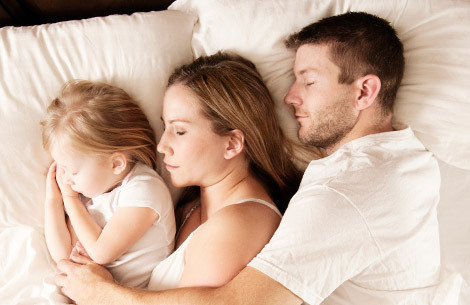 Essential Oil is calming, grounding, helping you fall naturally asleep. It can eliminate aches & pains & allows your body to better regulate your ideal sleeping temperature by opening your breathing passages. Dealing with symptoms of an imbalance of your hormone levels? 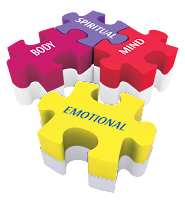 Symptoms like cramps, pain, headaches, constipation, fatigue, mood swings, nausea or anxiety dragging you down? Frankincense Essential Oil can help balance your hormones, providing relief of these symptoms. It also helps with regulating estrogen production & could help reduce the risks of tumors or cysts. The chemical make-up of Frankincense can inhibit the production of key inflammatory molecules that are associated with arthritis, asthma, IBS & more. Frankincense is useful in preventing the breakdown of cartilage tissue. It aids in the reduction of painful or dangerous inflammation. This makes it a natural option for conditions that affect muscles, joints & tendons. Maybe one of the most interesting findings is how Frankincense has been shown to help fight specific types of cancer cells. 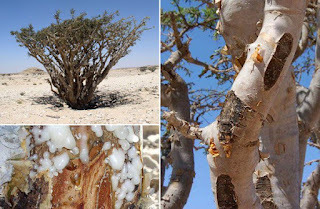 The chemical compound AKBA, which is found in Frankincense, is successful at killing cancer cells that are resistant to chemotherapy, thus making it a natural cancer treatment, potentially. Let’s take a moment & look at the last two paragraphs. Inflammation & cancer. From what I’m learning, these are the two biggest scourges of our lifetime & it’s believed that inflammation is actually one of the causes of cancer. 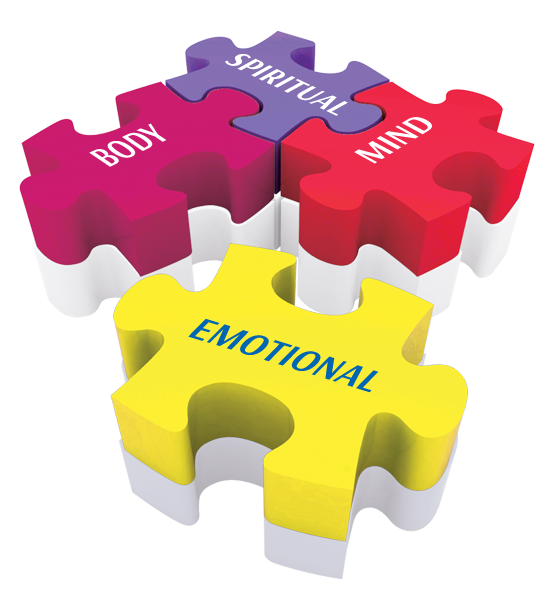 That leaves us with inflammation being the Number 1 cause of all our ailments, aches, pains, illnesses, diseases, etc. But it doesn’t really stop there. There is research that is showing that the cause of inflammation in the body is poor gut health. While we could take more steps back, lets stop the trail here. Frankincense can aid in gut health. Now, let me make this clear, I am not advocating oral ingestion of any Essential Oil. My research does show that in low quantity pure or organic Frankincense Essential Oil is safe. My research also shows you can use the oil topically for the same results. Be aware, results may vary & time could be longer. 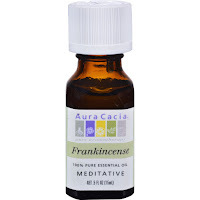 Doesn’t Frankincense Essential Oil sound like just the answer to almost anything? Well, as with everything, there is a darker side. Frankincense is usually well-tolerated, especially compared to prescription medications. Remember, all things in moderation & that includes Essential Oils. Ingesting large quantities of Frankincense can be toxic. Topical overuse (usually of undiluted oil) can cause adverse reactions. Frankincense is known to react negatively with some anti-coagulant medications, so folks with clotting issues should consult with their doctor first. So far, we’ve only looked at the physical side of Frankincense, but before we part today, I wish to quickly share another side of this incredible Essential Oil. The spiritual side. The woody, earthy, slightly fruity/sweet, warm & spicy aroma of Frankincense Essential Oil induces feelings of peace, satisfaction & relaxation. Add some drops to Epsom Salts for a hot stress-relief bath. Diffuse the oil in your home to fight anxiety. Using Frankincense Essential Oil Aromatherapy has aided some to a higher level of intuition & spiritual connection. So, you see, Frankincense Essential Oil is another must have oil for your first aid kit. The pure or organic oil is a little more expensive, so you may want, or need, to put it on your wish list. My friends, thank you for your attention today. I pray you are able to take glean some useful information from today’s study. Please click the share button for your friends. And leave me a comment. I read them all. Til next we meet, Be Blessed.